Searching for Log Home lighting? 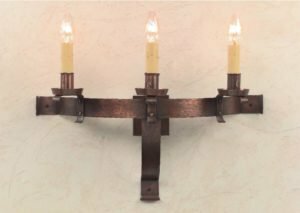 Perhaps Hammerworks English Tudor Wall Sconce Model S143A is just what you’ve been looking for! This distinctive half moon shaped sconce from our Olde English Tudor Lighting collection is handmade with solid antique copper. Need additional light for your space? 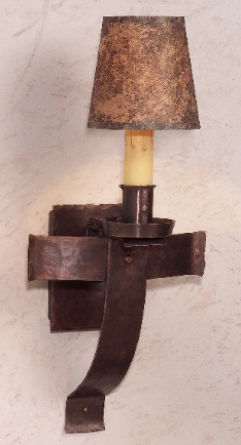 This handsome English Tudor Wall Sconce is also made in a three arm version. Choose our Tudor Wall Sconce S143 three candle model and create a lasting impression. Either way the exceptional quality and craftsmanship of these sconces is evident at first glance. You will be enticed to take a second look when you see the details of the hand hammered copper surface and sturdy rivets. If you are looking for a complementary chandelier to go along with your English Tudor Wall Sconce, take a look at our dramatic Tudor Style Copper Chandelier CH421. This imposing handcrafted chandelier is available in both six and eight arm options, with or without shades. The same design features as on the sconces are evident. Whether you choose the sconces or the chandelier or both, each candle is rated for up to sixty watts. Most notably you can easily carry the same theme throughout the interior and exterior of your home with our Olde English Tudor Lighting collection. With their heavy gauge copper construction these extraordinary light fixtures are made to last for generations to come. With a look unique to Hammerworks the outstanding craftsmanship is second to none. We create the splendid English Tudor Copper Wall Lantern OWW1 in two sizes and three styles. In addition the Tudor Style Copper Post Lantern OWP1 is also available in two sizes. In terms of overhead lighting Tudor Style Ceiling Copper Light OWC1 coordinates nicely with any of the English Tudor Wall Sconce collection.